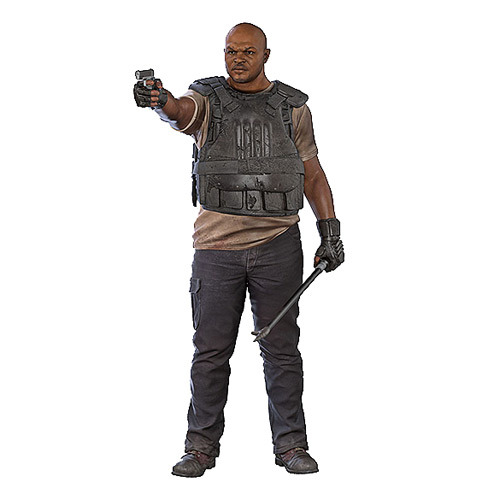 This heroic Walking Dead TV Series 9 T-Dog Action Figure is ready for battle in his removable Riot Gear Vest. The action figure stands about 5-inches tall, includes approximately 22 points of articulation, pistol, fire poker, and industrial bolt cutters. One of the original Atlanta survivors, T-Dog was a kindhearted and well-intentioned member of Rick's group. He never hesitated to charge in and help those in need. Even when all seemed lost he put others before himself and ultimately sacrificed himself to save Carol from Walkers overrunning the prison. Ages 12 and up.